The spotted hyena has a shoulder height of about 85cm and the weight is about 70kg. The swahili word for it is 'fisi'. 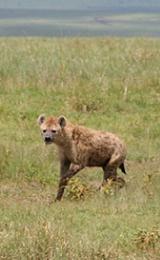 Their bulky build, short hind legs, brownish coat, powerful jaws and dog-like expression characterize the hyena. Contrary to popular myth, these animals are not exclusively scavengers: in this particular case it is an adapted hunter capable of killing an animal as large as a wildebeest. Sociable animals, and fascinating to observe, they live in loosely structured clans of about ten animals and more, let by females who are stronger and larger than the males. The spotted hyena is the largest hyena, distinguished by its blotchy spotted coat. Most hunting, like most foraging, is done alone. Hyenas and Lions are very competitive. Hyenas will usually loose their kill to lions and have to wait for the lion to finish eating. They do however unnerve females and immature lions by advancing threateningly. With big male lions they will get nowhere! They will take a Leopard or Cheetah kill at every opportunity and Vultures are the 'spotter networks' to find a meal during the daytime. At night it’s common to hear the manic cackles of a hyena, guaranteed to send a shiver up your spine. It is particularly unnerving while camping, and hearing them come nearer and nearer. Amboseli National Park and the Masai Mara National Reserve have particularly good sightings.